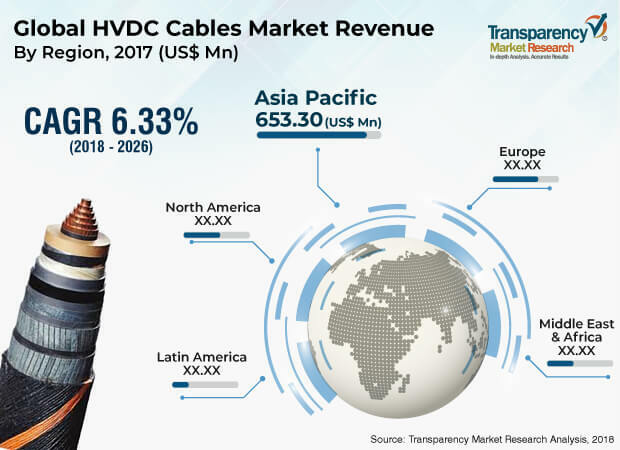 The global HVDC cables market was valued at around US$ 1.4 Bn in 2017 and is anticipated to expand at a CAGR of more than 6.0% from 2018 to 2026, according to a new report by Transparency Market Research (TMR) titled ‘HVDC Cables Market – Global Industry Analysis, Size, Share, Growth, Trends, and Forecast, 2018–2026.’ HVDC cables transmit high voltage direct current over long distances, as they are more efficient than the HVAC technology. This study divides high voltage into three segments: high voltage (35 kV to 475kV), extra high voltage (476 kV to 800 kV),and ultra-high voltage (above 800 kV). In terms of power transmission, majority of HVDC transmission lines in Europe transport electricity from one country to another. In China, most of HVDC transmission lines transport electricity from the eastern part to the western part of the country. Several such lines can also be found in the U.S., Canada, Germany, and India. Europe is planning to install HVDC transmission lines from a few southern countries such as Cyprus to countries in North Africa such as Egypt. HVDC cables are also used to provide electricity to oil & gas infrastructure such as FPSOs and other platforms located offshore, as oil & gas is a large industry. Similarly, connecting renewable power plants, especially wind power and solar power plants, located offshore to the main grid is another important function of HVDC cables. HVDC cables require large patches of land. This is especially true in case of overhead and underground cables. These cables also require a right of way, i.e. the land through which the overhead or underground lines pass cannot be used for another purpose. In many cases, it is difficult to acquire land for such purposes. This adversely affects the pace of construction of HVDC transmission lines. Acquisition of land becomes an even bigger problem when cables are to be laid close to human settlements. The usage of mass impregnated cables and oil-filled cables was common when some of the first HVDC transmission lines were installed in the early second half of the 20th century. They remained the mainstay of HVDC transmission lines for a few decades. Toward the end of the 20th century, XLPE extruded cables were designed for HVDC transmission networks. These cables carry several advantages that drive their usage over traditional cables. For example, these polymer insulated cables are lighter and easier to handle. They offer easier jointing options than paper insulated cables. A higher conductor temperature can be used with XLPE cables. In turn, this allows for a smaller size of cable along with more compact construction. XLPE cables also allow the use of a wide range of additives such as anti-oxidants, cross-linking agents, lubricating additives, scorch resistant additives, and those which increase the cross-linking density. Thus, these cables can be used in a wide range of environments such as overhead lines, submarine, and underground. In terms of type, the global HVDC cables market has been divided into mass impregnated cables, extruded cables, and others (including oil-filled cables and superconducting cables). Extruded cables hold the key share of the market. The segment is expected to maintain its dominance during the forecast period. Based on application, the market has been segregated into overhead line, submarine, and underground. The overhead line segment accounts for major share of the market owing to the low cost and comparative ease of construction. In terms of region, the market has been classified into North America (the U.S. and Canada), Latin America (Brazil, Mexico, and Rest of Latin America), Europe (Germany, the U.K., France, Italy, Spain, Russia & CIS, and Rest of Europe), Asia Pacific (China, India, Japan, ASEAN, and Rest of Asia Pacific) and Middle East & Africa (GCC, South Africa, and Rest of Middle East & Africa). A few manufacturers of HVDC cables operate across the globe. Most of these are based in Europe and Asia Pacific. HVDC cables is a difficult market to enter, as it requires a high level of technical expertise. Hence, intense competition exists among the players already operating in the market.